Most of us have accumulated a lot of stuff over the years: from old picture frames and photos to antique shop finds and inherited furniture, as well as lots of books that we are reluctant to part with. They are often kept in cupboards or out in the garage because they are imbued with memories. So instead of letting them moulder, how can we give these possessions a new lease of life and subtly incorporate them back into our homes? Modern taste maybe eclectic more than ever – we are being encouraged that anything goes together, whatever style or period. It’s not what you have but what you do with it, and nowadays less is more. But cluttered displays of ornaments are unfashionable. Nobody wants their home to look like an old junk shop, so here a few ideas to create a smart and individual home re using some of the things that have sentimental value. I always carefully examine old rugs before despatching them. The good section of an old Turkey carpet now covers a footstool. Another example is old headscarves, which are currently out of fashion. Some of the beautiful silk ones can be made into glamorous and unique cushions or lampshades, while a boring old lamp base can certainly be revitalised with a beautiful and original shade. Thanks to digital technology old photographs and even prints can be scanned, with the resulting collage made into wallpaper, bags, screens, deck chairs and tablecloths. See www.bagsoflove.co.uk for examples of how this can be achieved. A lick of paint will transform that rather a boring chest of drawers that has been in the family forever. Annie Sloan author of many ‘how to’ books on repainting and decorating furniture has a range of chalk paints that complement this furniture. Grey and French blue are colours that smart colours but in certain rooms, such as a nursery or a kitchen, something bolder such as Napoleonic blue or a scarlet will brighten the room. “You can get away with strong colours if it’s tempered by surrounding whites and neutral,” says Annie Sloan, in her book Colour Recipes for Painted Furniture (Cico Books). However, as Annie notes, don’t paint mahogany or walnut as it is not good for this beautiful wood, which will come back in fashion one day. Grouping and arranging is key to showing of your favourite things to full advantage. It doesn’t matter whether they are a piece of driftwood, a child’s shoe or old china but to harmonise the display each piece should be shown next to something in a complimentary colour. For example the red detail on vintage cup could be next to a vintage red toy. Maverick designer/ blogger Abigail Ahern exhorts her readers to arrange pieces according to “the Alice in Wonderland” effect, by which a tiny object sits next to a giant one. However more conservative designers opt for a more graded height variety approach. And what do with all the books? Look around the house and you will see wasted space, for example under the stairs. So, try running book cases from floor to ceiling. One designer uses l book cases as room dividers. In a large open plan kitchen / living room, the TV area is delineated by book shelves at around 4ft high. And for good karma, if you have to let some things go, say goodbye with a kiss and wish them well in their new home. Photograph: Christopher Drake. 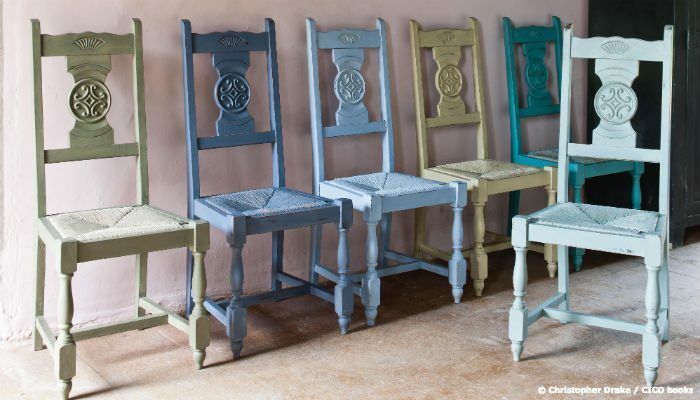 Reproduced with kind permission from Colour Recipes for Painted Furniture by Annie Sloan (CICO Books, £14.99). Read more from Hugh on the art of picture framing and opening up your room using light and art.